Click on the ConnectCarolina Student Center link. Log in with your Onyen and password. This will direct you to the Student Self Service site through the National Student Clearinghouse (NSC). Under the Obtain an Enrollment Certificate option, select Current enrollment for the current term, or All enrollment to show your enrollment history. 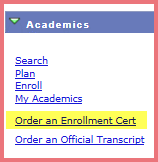 Then click the Obtain an Enrollment Certificate link to process the request. Important: Note to incoming new students, you can follow option #2 below! Your link in your Student Center won’t appear until a few weeks into fall term. If you need an enrollment certification sooner, just contact us!